Baseball is finally back in Chicago, as the White Sox welcome Yusei Kikuchi and the streaking Mariners to Guaranteed Rate Field for a Friday matinee. We'll give you our lean for the game. It took [an extra day](https://www.betchicago.com/white-sox-home-opener-rescheduled-friday) due to a weather postponement, but baseball is finally back in Chicago, as the White Sox welcome Yusei Kikuchi and the streaking Mariners to Guaranteed Rate Field for their home opener Friday. We give our lean for the game below. We've also got $1,000 to give away Friday in our Chicago Baseball Southside Contest. Make six correct predictions and win a share or all of the money. __[Play for free here](https://betchicago.chalkline.com/games/cws-opener)__. Seattle (7-1) is between a -120 and -125 favorite as of Friday morning for the 1:10 p.m. CT game on NBC Sports Chicago. Chicago (2-3) is between +110 and +115, with the total set 8 (UNDER -115) at most bet shops. 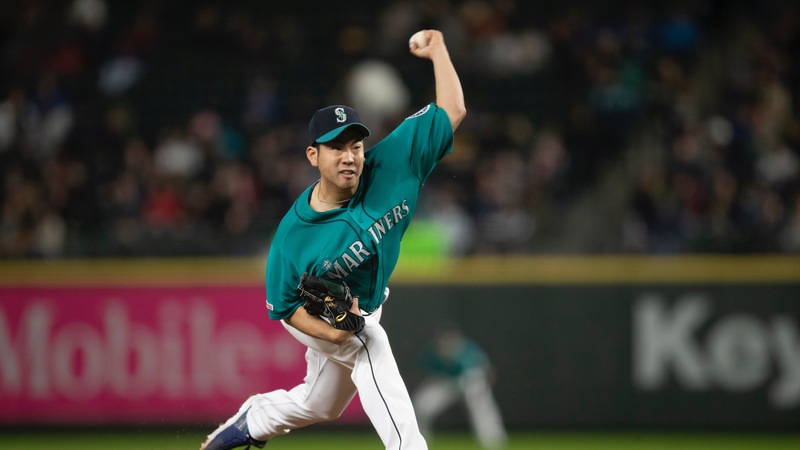 The 27-year-old lefty Kikuchi (0-0, 2.53 ERA), a three-time All-Star in Japan who signed a four-year, $56 million deal this offseason with the Mariners, has been decent in his two MLB starts, allowing five runs (three earned) in 10 2/3 innings. He's given up eight hits, including two homers (to Xander Bogaerts and J.D. Martinez), with eight strikeouts and a walk. His second start -- Friday against Boston -- was the only game Seattle has lost this season, after beating the A's twice in Japan to open the season and before taking three of four from the Red Sox and two from the Angels at home. The Mariners have been winning with surprising power, leading the American League with 17 home runs. Tim Beckham, Jay Bruce and Domingo Santana each have three, and while all three have had solid power seasons in the past, none had more than Beckham's 12 last season. <a href="https://www.youtube.com/watch?v=XiDr8P5tCxs" class="embedly-card" data-card-width="100%" data-card-controls="0">Embedded content: https://www.youtube.com/watch?v=XiDr8P5tCxs</a> White Sox righty Reynaldo Lopez (0-1, 9.00) didn't allow any home runs in his first start of the season -- an 8-6 Chicago loss in Kansas City -- but he was ineffective, allowing four runs on six hits and four walks in four innings with only two strikeouts. The White Sox, who'll play all 1:10 p.m. CT games during their six-game homestand, have been underdogs for all six of their games. But they're coming off their best performance of the early season, [an 8-3 win](https://www.thescore.com/mlb/events/65271) Wednesday afternoon in Cleveland. Leury Garcia had four hits and scored three times, Yoan Moncada hit a two-run homer, Jose Abreu drove in three, and Carlos Rodon struck out nine and allowed only one unearned run in six innings. The OVER has been the play early for both these teams, as it's 4-1 in Chicago games and 5-3 for Seattle, though the last two have gone UNDER for the Mariners. Kikuchi's father died from cancer over the weekend, but he has remained with the team, which [he said was his father's desire](https://japantoday.com/category/sports/mariners%27-kikuchi-to-remain-with-team-after-death-of-father). Not to be callous, but it's understandable if Kikuchi's mind is elsewhere Friday, which could benefit the White Sox. OVER 8 is also a recommended play with two hot offenses against two shaky starters. __MORE:__ [Fantasy baseball waiver wire adds/drops](https://www.betchicago.com/fantasy-baseball-waiver-wire-add-drop-mlb-opening-weekend) | [MLB first manager fired odds](https://www.betchicago.com/mlb-first-manager-fired-odds-dave-martinez-rick-renteria-joe-maddon) ## Friday baseball odds, probable pitchers *Odds from Westgate as of Friday morning. Check [our MLB odds page](https://www.betchicago.com/mlb-betting/odds) for updated betting lines. All times Central. __Mariners (-120) at White Sox (+110), 1:10 p.m. (CWS home opener); Total: 8 (UNDER -115)__ SEA: 7-1 CWS: 2-3 Pitching matchup: Kikuchi vs. Lopez __Dodgers (-130) at Rockies (+120), 3:10 p.m. (COL home opener); Total: 10.5 (OVER -115)__ COL: 3-4 LAD: 5-2 Pitching matchup: LAD Kenta Maeda (1-0, 4.05) vs. COL LHP Tyler Anderson (0-1, 9.00) Betting note: Los Angeles was 13-7 last season against Colorado. __Padres (+155) at Cardinals (-165), 3:15 p.m. (STL home opener); Total: 7.5 (OVER -120)__ SD: 4-3 STL: 3-3 Pitching matchup: SD LHP Nick Margevicius (0-1, 1.80) vs. STL RHP Jack Flaherty (0-0, 8.31) Betting note: The OVER is 4-1-1 in St. Louis games, but 2-5 in San Diego games. __Rays (-125) at Giants (+115), 3:35 p.m. (SF home opener); Total: 7 (OVER -115)__ TB: 5-2 SF: 2-5 Pitching matchup: TB RHP Tyler Glasnow (1-0, 1.80) vs. SF RHP Dereck Rodriguez (1-0, 3.60) Betting note: Glasnow only has five wins in 68 career appearances (29 starts). __Reds (+114) at Pirates (-124), 6:05 p.m.; Total: 8 (UNDER -115)__ CIN: 1-5 PIT: 2-3 Pitching matchup: CIN RHP Sonny Gray (0-1, 6.75) vs. PIT RHP Joe Musgrove (0-0, 0.00) Betting note: Gray has only one quality start in his last 13 outings dating back to last season. __More on Reds-Pirates__: [Full betting preview](https://www.betchicago.com/mlb-odds-betting-reds-pirates-sonny-gray-friday) __Twins (+140) at Phillies (-150), 6:05 p.m.; Total: 8 (OVER -120)__ MIN: 4-1 PHI: 4-1 Pitching matchup: MIN RHP Jake Odorizzi (0-0, 1.50) vs. PHI RHP Nick Pivetta (0-0, 7.71) Betting note: Odorizzi tied his career high of 11 strikeouts Saturday against the Indians, but Minnesota lost, 2-1, on a run in top of the ninth. __Red Sox (-126) at D-backs (+116), 6:10 p.m. (ARI home opener); Total: 8 (O/U -110)__ BOS: 2-6 ARI: 3-4 Pitching matchup: BOS RHP Rick Porcello (0-1, 13.50) vs. ARI RHP Zack Godley (0-1, 11.81) Betting note: Porcello walked more batters (four) than he struck out (three) in Sunday's loss to the Mariners. He did that only twice in 33 starts last season. __Blue Jays (+145) at Indians (-155), 6:10 p.m.; Total: 7 (OVER -120)__ TOR: 3-5 CLE: 3-3 Pitching matchup: TOR RHP Trent Thornton (0-0, 0.00) vs. CLE RHP Shane Bieber (0-0, 4.50) Betting note: The UNDER is 7-1 in Toronto games. __Marlins (+138) at Braves (-148), 6:20 p.m.; Total: 8.5 (UNDER -115)__ MIA: 2-5 ATL: 3-3 Pitching matchup: MIA Pablo Lopez (1-0, 5.06) vs. ATL RHP Kevin Gausman (season debut) Betting note: The OVER is 5-1-1 in Miami games and 4-1-1 in Atlanta games. __Cubs (+106) at Brewers (-116), 7:10 p.m., WGN; Total: 8.5 (O/U -110)__ CHC: 1-5 MIL: 6-1 Pitching matchup: CHI LHP Jose Quintana (0-0, 4.50) vs. MIL RHP Brandon Woodruff (1-0, 3.60) Betting note: Chicago has lost five straight, matching its longest skid from last season (twice). __A's (+161) at Astros (-172), 7:10 p.m. (HOU home opener); Total: 8 (O/U -110)__ OAK: 6-4 HOU: 2-5 Pitching matchup: OAK RHP Frankie Montas vs. HOU RHP Collin McHugh (0-1, 3.60 ERA) Betting note: Seven Oakland games had gone UNDER before two straight OVERs. __Rangers (+109) at Angels (-119), 9:07 p.m. (LAA home opener); Total: 8 (OVER -125)__ TEX: 5-2 LAA: 1-6 Pitching matchup: TEX RHP Lance Lynn (0-0, 11.12) vs. LAA Felix Pena (0-1, 9.82) Betting note: The first six Los Angeles games went UNDER before Thursday's OVER. __PLAY:__ Our [free-to-play $1,000 Chicago Baseball Northside and Southside contests](https://betchicago.chalkline.com).